Carrie Haddad Gallery is pleased to announce an early summer exhibit featuring abstract landscape paintings by Nancy Rutter, fire drawings by Paul Chojnowski, small abstract paintings by Willie Marlowe, new narrative paintings by David Konigsberg and witty “wordy” sculptures by Paul Katz. The work will be on view from June 2 to July 10 with a reception for the artists on Saturday June 4th from 6 – 8 PM. Nancy Rutter takes her inspiration from nature, fascinated with the tonal interplay of color and form. Columbia County in upstate New York is a place of varying vistas and beauty with ever-changing atmosphere and light and shadow dancing across the views. “I love to rearrange and simplify nature transformed into abstract forms and brilliant color. This journey, sometimes successful, is what keeps me on this course.” The artist will exhibit large, exuberant and lushly colorful paintings of her “neighborhood”, a rural landscape of gardens, farms, roads, ponds and fields. Rutter studied at the High School of Music and Art and the Art Students League in NYC, has taken numerous printmaking workshops and lived and worked in Ireland and France. Her work is in many private collections. Chojnowski’s work has evolved over the years through a period of geometric abstraction to incorporate his figurative academic training. A distinguishing characteristic has been the use of nontraditional media and tools in his art making. His current work, images burned into paper and wood, is an extension of that predisposition; these burned drawings evolved as a result of his conscious effort to embrace art historical traditions while rejecting the traditional processes. On view from his “Searchlights” series will be haunting night scenes burned into maple panel. 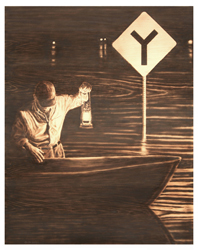 A particular painting titled “After the Deluge” depicts a man standing thigh-high in floodwaters behind a boat and holding a lantern, eerily illuminating a road sign and ripples on the water, and the wood grain, a story unfolding. Paul Chojnowski was born in New England and attended Hobart College in Geneva, New York where he received his Bachelor of Arts in painting and art history. He studied briefly at the Kansas City Art Institute and began his career in the 80’s while living in Atlanta. He has returned to his native Berkshire Hills of western Massachusetts. Willie Marlowe’s intimately scaled acrylic paintings on paper are jazzy and abstract but with references to ancient art and archeology. (Her early influences were Medieval manuscript illuminations and Persian and Indian miniatures.) The luminous surfaces are achieved by using an intense palette and successive layers of translucent glazes, so that the work emits a radiant spectrum that is almost neon. She makes playful use of geometric and organic shapes within a rhythmic complex composition. Marlowe’s work is informed by her extensive travels, sabbaticals, and teaching experiences in Italy, Ireland, the West Indies, the Yucatan and Russia. She is currently Professor Emerita, Sage Colleges, Albany. David Konigsberg is a conceptual realist whose work has been shown in galleries and public art spaces throughout the United States. He paints from a writer’s point of view, creating conceptual literary narratives using recurring symbols and characters: figures in airships and cars, a simple farmhouse, dirt road or clouds in the bucolic Columbia County landscape, and a new series of intimate domestic scenes titled “Morning Paper”, Coffee, Goldfish. His training as a printmaker is evident in the beautiful linear patterns and scumbled paint surfaces. Konigsberg was born in rural Pennsylvania now divides his time between Brooklyn and Ghent. He is actively involved in the Columbia Land Conservancy and its quest to preserve open space. Carrie Haddad Gallery is located at 622 Warren Street in Hudson, NY. Gallery hours are 11 – 5 daily, closed on Wednesday. You can call the gallery at (518) 828 1915 for directions or more information, or see the show online at www.carriehaddadgallery.com.